Mike Huckabee says he's against repealing parts of the 14th Amendment. (CNN) – Mike Huckabee says he's against changing portions of the Constitution that automatically grant citizenship to children of immigrants born in the United States - a position that puts the potential 2012 Republican presidential candidate at odds some of his party's most prominent figures. 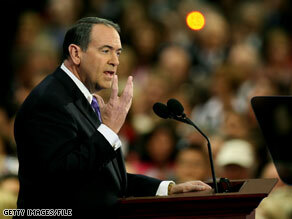 "The Supreme Court has decided that, I think, in three different centuries, said Huckabeee. "In every single instance, they have affirmed that if you are born in this country, you are considered to be a citizen. The only option there is to change the constitution." Asked specifically if he would favor such an effort to change the constitution, Huckabee said flatly, "No." "Let me tell you what I would favor. I would favor having controlled borders," he said. "But that's where the federal government has miserably and hopelessly failed us." The Reconstruction-era 14th Amendment guarantees equal protection of law and defines who is a U.S. citizen. Critics of illegal immigration have long accused migrants – particularly those coming from Mexico or Latin American countries – of giving birth to children in the United States in hopes that their babies' citizenship will keep them in the country as well as to avail their children of the more generous benefits of the wealthier United States. Ok don't take out the right to being a natural born citizen, but it should be then that any illegal immigrants who have children born in the U.S.
are not automatically citizens of this country. Anyone who comes to the country legally and has children then no problem. But I can't see using my tax money to let some one come into this country illegally just to have a child to say he/she is an American and then allow the parents to stay because their child is automatically a citizen of the United States. What about those who come to this country and apply to stay going through channels and then sending them home where is the Justice. WOW!!! A Republican with integrity. I don't often agree with Mr. Huckabee's policies, but on this one, I do. Thank you Mike. Finally a sensible Republican. Leave the constitution alone.....fix the imigration laws. Hes Right of course, Like it or Not the 14th Amendment is here to stay. Mike Huckabee has always been soft on illegal immigrants, so what is new??? Huchabee just lost any support I may have provided him. Good for him, at least he looked like he has read the US Constitution unlike Lindsay Graham, McCain, Coburn, McConnell and Kyl whose only intention are to use it as a political issue for short term political gain. No amnesty. We are rewarding law breakers. For once i agree with Mike Huckabee, any one borned in this Country, the United States of America, should be a citizen. I believe changing the constitution to address illegals giving birth to babies in the Unites States is a wonderful idea. If a person is here illegally, their child should not be eligible for citizenship. This is just another loop hole for getting into the country. At the same time, parents need to have a birth certificate in order to enroll their children in an American school. It might help weed out illegals, though like drivers licenses and addresses and even social security numbers, the certificate can be falsified. So, lets put people back to work checking for falsified paper work. Tom Tancredo, Mr. illegal alien has said the same thing. Every now and then a few of the right wingnuts uses some common sense. That is clearly what Huckabee and Tancredo are doing here. The whole 14th amendment thing is a joke the right wing is feeding to their craziest followers.